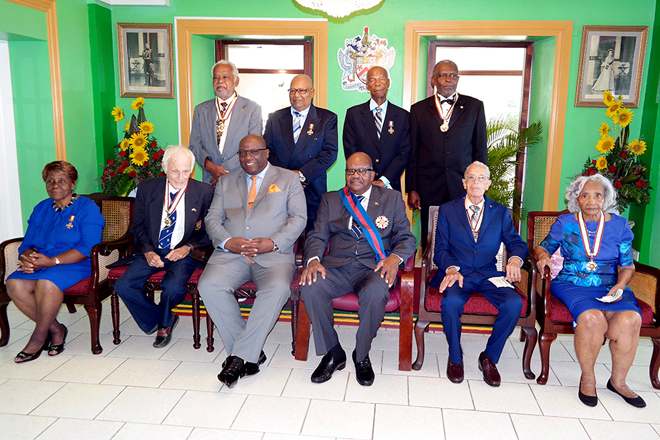 (Press Unit in the Office of the Prime Minister) – The meritorious contributions of eight distinguished nationals of St. Kitts and Nevis were duly recognized today, Wednesday, February 21, at an Investiture Ceremony held at Government House. There, the Governor General, His Excellency Sir Tapley Seaton conferred the Companion of The Star of Merit (C.S.M.) to five deserving individuals and the Medal of Honour (MH) to another three nationals for their contributions towards the development of the Federation. The Companion of The Star of Merit was awarded to Mr. Jacques Cramer for his contribution to Commerce/Public Service; Mrs. Agnes Morton for her work in the fields of Education and Voluntary Service; Mr. Arthur Evelyn for his contribution in Public Service/Community Activism; Mr. Calvin Farier for his work in Education/Public Service, and Mr. Melvin Edwards for his contribution to Culture/Local, Regional and International Credit Union. The Medal of Honour was conferred upon Mrs. Olvis Dyer for her contribution to Education and Community Service; Mr. Samuel Powell for his contribution to Agriculture and Music and Mr. Elmo Liburd for his contribution to Education/Public Service. Prime Minister Dr. the Honourable Timothy Harris congratulated the eight recipients of the prestigious national awards, noting that it is testimony of their hard work and dedicated service throughout the years. “Today’s Investiture is a culmination of your many years of devoted service, outstanding commitment and leadership in your respective areas of service and expertise. In honouring you, we also pay our respects to those who stood with and by you and allowed you the space, time and support to serve our country faithfully and loyally,” the prime minister said. Also in attendance at Wednesday’s auspicious ceremony was Acting Deputy Governor-General for Nevis, Her Honour Marjorie Morton CSM; St. Kitts and Nevis’ only living National Hero, Dr. the Right Excellent and Right Honourable Sir Kennedy Simmonds, and other members of the Federal Cabinet.